Inside the new—and exploitative—temporary economy. First published by ProPublica and republished here under a Creative Commons Attribution-NonCommercial-NoDerivs 3.0 Unported License. Updated July 1 with new data from the Bureau of Labor Statistics. It’s 4:18 am and the strip mall is deserted. But tucked in back, next to a closed-down video store, an employment agency is already filling up. Rosa Ramirez walks in, as she has done nearly every morning for the past six months. She signs in and sits down in one of the 100 or so blue plastic chairs that fill the office. Over the next three hours, dispatchers will bark out the names of who will work today. Rosa waits, wondering if she will make her rent. The people here are not day laborers looking for an odd job from a passing contractor. They are regular employees of temp agencies working in the supply chain of many of America’s largest companies—Walmart, Macy’s, Nike, Frito-Lay. They make our frozen pizzas, sort the recycling from our trash, cut our vegetables and clean our imported fish. They unload clothing and toys made overseas and pack them to fill our store shelves. They are as important to the global economy as shipping containers and Asian garment workers. The proportion of temp workers in the labor force reached its peak in early 2000 before the 2001 slump and then the Great Recession. But as the economy continues its slow, uneven recovery, temp work is roaring back ten times faster than private-sector employment as a whole—a pace “exceeding even the dramatic run-up of the early 1990s,” according to the staffing association. The overwhelming majority of that growth has come in blue-collar work in factories and warehouses, as the temp industry sheds the Kelly Girl image of the past. Last year, more than one in every twenty blue-collar workers was a temp. Many economists predict the growth of temp work will continue beyond the recession, in part because of healthcare reform, which some economists say will lead employers to hire temps to avoid the costs of covering full-time workers. 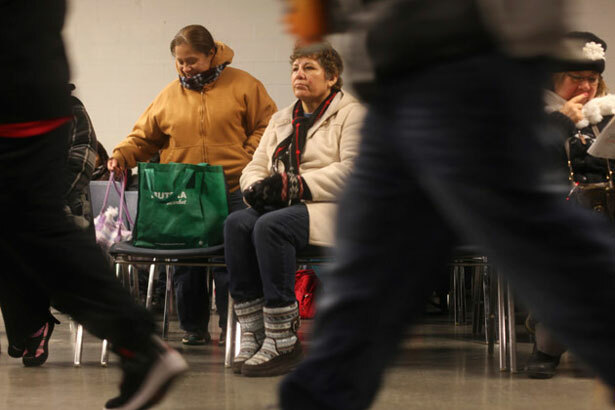 Rosa, a 49-year-old Mexican immigrant with thin glasses and a curly bob of brown hair, has been a temp worker for the better part of twelve years. She has packed free samples for Walmart, put together displays for Sony, printed ads for Marlboro, made air filters for the Navy and boxed textbooks for elite colleges and universities. None of the work led to a full-time job. Even though some assignments last months, such as her recent job packaging razors for Philips Norelco, every day is a crapshoot for Rosa. She must first check in at the temp agency in Hanover Park, Illinois, by 4:30 am and wait. If she is lucky enough to be called, she must then take a van or bus to the worksite. And even though the agency, Staffing Network, is her legal employer, she is not paid until she gets to the assembly line at 6 am. In Kane County, Illinois, where Rosa lives, one in every fourteen workers is a temp. Such high concentrations of temp workers exist in Grand Rapids, Mich.; Middlesex County, New Jersey; Memphis, Tennessee; the Inland Empire of California; and Lehigh County, Pennsylvania. In New Jersey, white vans zip through an old Hungarian neighborhood in New Brunswick, picking up workers at temp agencies along French Street. In Joliet, Illinois, one temp agency operated out of a motel meeting room once a week, supplying labor to the layers of logistics contractors at one of Walmart’s biggest warehouses. In Greenville County, South Carolina, near BMW’s US manufacturing plant, one in twelve workers was a temp in 2012. A decade before, it was one in twenty-two. It is a practice that George Gonos, a sociologist at SUNY-Potsdam who has spent his career studying the temp industry, calls the modern version of the “shape-up“—a practice in which longshoremen would line up in front of a boss, who would pick them one by one for work on the docks. The day after Thanksgiving 1960, Edward R. Murrow broadcast a report called “Harvest of Shame,” documenting the plight of migrant farmworkers. Temp workers today face many similar conditions in how they get hired, how they get to work, how they live and what they can afford to eat. Adjusted for inflation, those farmworkers earned roughly the same fifty years ago as many of today’s temp workers, including Rosa. In fact, some of the same farm towns featured in Murrow’s report have now been built up with warehouses filled with temps. African-Americans make up 11 percent of the overall workforce but more than 20 percent of temp workers. Willie Pearson, who is African-American, has been a full-time worker at BMW’s South Carolina plant for fourteen years. But since at least 2005, he said, he hasn’t seen anyone who’s “been hired straight on. It’s all been through temporary agencies.” The company says “after six months they can hire them,” he said, “but I’d say it’s only one out of five” who actually lands a full-time job. In the 1960s, agencies such as Kelly Services and Manpower advertised their services as women’s work, providing “pin money” to housewives, according to Erin Hatton, a SUNY Buffalo sociologist and author of The Temp Economy. And they marketed the advantages of workers that the host company wasn’t responsible for—a theme that continues today. 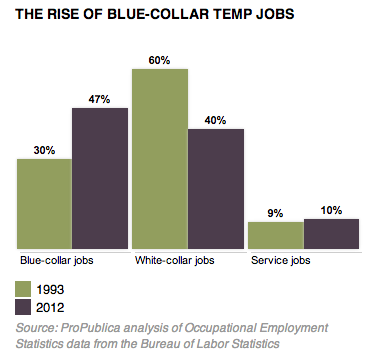 Gradually, temp firms began moving into blue-collar work. At the end of the 1960s—a decade in which the American economy grew by 50 percent—temp agencies began selling the idea of temping out entire departments. Relying on temps only for seasonal work and uncertain times was foolish, the agencies told managers over the next two decades. Instead, they said companies should have a core of, say, five employees supplemented by as many as fifty temps, Hatton wrote. More recently, temp firms have successfully lobbied to change laws or regulatory interpretations in thirty-one states, so that workers who lose their assignments and are out of work cannot get unemployment benefits unless they check back in with the temp firm for another assignment. It is now 5:03 am at Staffing Network, and the first batch of workers waits outside to board the school bus for Norelco. The agency said it offers complimentary transportation for its employees’ benefit. But worker advocates say vans help the temp agencies by ensuring they provide their corporate clients with the right number of workers at the right time. Many metro areas don’t have adequate transportation from the working-class neighborhoods to the former farmland where warehouses have sprouted over the past fifteen years. So a system of temp vans has popped up, often contracted by the agencies. Workers in several cities said they feel pressured to get on the vans or lose the job. They usually pay $7 to $8 a day for the round trip. Workers describe the vans as dangerously overcrowded with as many as 22 people stuffed into a fifteen-passenger van. In New Jersey, one worker drew a diagram of how his temp agency fit seventeen people into a minivan, using wooden benches and baby seats and having three workers crouch in the trunk space. It is now 5:20 am, and a second batch of workers has been called for Norelco. Dispatchers are starting to tap workers for Start Sampling, which provides free samples of items like shampoos, coffee and cat food on behalf of retailers and consumer product companies. Berto Gutierrez, who has worked several stints at the Walmart warehouse in Elwood, Illinois, provided ProPublica with a copy of a 2011 paycheck from subcontractor Eclipse Advantage. The check shows he was paid only $57.81 for 12.5 hours of work, or $4.62 an hour. Neither Eclipse, Schneider nor Walmart provided an explanation for Gutierrez’s paycheck. And don’t look for Obamacare to fix it. Under the law, employers must provide health coverage only to employees who average thirty hours a week or more. After pressure from the temp industry and others, the IRS ruled that companies have up to a year to determine if workers qualify. With the major provisions of healthcare reform set to take effect in 2014, there’s growing evidence that 2013 is becoming a boom year for temping out. TempWorks, which sells software that keeps track of payroll and worker orders, says sales to staffing agencies have been going through the roof and that temp firms tell them the uptick is because of Obamacare. In December 2011, a Chicago temp worker died after he was scalded by a citric acid solution. The skin cream and shampoo factory he was assigned to failed to call 911 even as his skin was peeling from his body. In August 2012, a Jacksonville temp was crushed to death on his first day of work at a bottling plant when a supervisor told him to clean glass from underneath a machine that stacks goods onto pallets—a job that OSHA said he wasn’t trained to do. And in January, a temp was killed at a paper mill outside Charlotte, North Carolina, when he was overcome by toxic fumes while cleaning the inside of a chemical tank. That law requires temp agencies to give workers written notice of the basics: whom they will work for, how much they’ll be paid and what safety equipment they’ll need. The law limits transportation costs and prohibits fees that would push workers’ pay below minimum wage. Agencies must also reimburse the worker if they are sent to a worksite only to find out there is no job for them there. Even in states that have them, the laws are honored mostly in the breach. For example, Illinois prohibits temp agencies from charging for transportation. But many have gotten around the law by using so-called raiteros, who act as neighborhood labor brokers for the agencies and charge for transportation. The law also requires an employment notice stating the name of the host company, the hourly wage and any equipment needed. Out of more than fifty Chicago-area workers interviewed for this story, only a handful had ever received one. Around 6 am, she again inquires if there will be any work. The dispatcher tells her to give it fifteen more minutes. Michael Grabell, ProPublicaMichael Grabell covers economic and labor issues for ProPublica. He has produced stories for the New York Times, USA Today, NPR and the CBS Evening News. His investigative work has included stories on the TSA, the Lance Armstrong doping allegations, chemicals stored near schools and neighborhoods, and a bus fire that killed 23 nursing home patients. Before joining ProPublica, Grabell was a reporter at The Dallas Morning News. He is the author of Money Well Spent?, a book about President Obama’s stimulus package and his efforts to revive the economy from the Great Recession.